Born in Russia raised in India, but 100% American! In November 2010, while stationed in New Delhi, India, a gypsy caravan from Russia came through with 2 amazing puppies. These puppies were 4 weeks old and at first looking I new I had to have them. To my dismay, they had sold Godric's brother the night before and only had him left. Godric has been raised in New Delhi with me ever since! I am lucky to have a house with full AC, and able to take him to the doggy pool for exercise. Godric is currently living in New Delhi with a friend as I am stuck in the U.S and am hoping soon to be able to re-unite with my best friend. 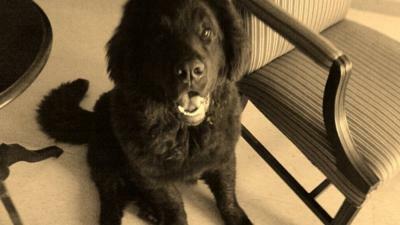 I just thought I would shar my short story, to prove, that Newfies can adapt to any environment and make wonderful additions to the family. We are constantly photographed, and stopped on the road (have even caused accidents) because of how rare they are in India. His pictures are a little old, I feel like he doesnt stop growing, currently at about 135 lbs.